Ozzie and I got up at 4:00 AM this morning to watch the Royal Wedding! 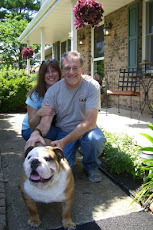 ( He is an English Bulldog after all! ) What a spectacle! We are still watching it at the moment and we are waiting for the wedding party to enter Buckingham Palace and for the kiss between the bride and groom on the balcony. William looks quite handsome in his royal red uniform and Catherine is a stunning bride! Her gown very sophisticated and similar to the one Grace Kelly wore on her wedding day! Ozzie is getting impatient, not for the kiss but for his breakfast so I will go before he gets cranky! "Yeah, kiss shmiss, who cares I'm hungry!" Okay Oz calm down I'll get your kibble! Many happy years for the Duke and Duchess of Cambridge! Cheerio and have a great weekend all! A little piece between your cheek and gum will do ya! Hope this has a savory meat filling in the center! Oh the sun is shining and everything is blooming...aachoo! Oh well a small price to pay for some wonderful weather. We had a delightful Easter with a full house of friends and family on Sunday. Ozzie is still exhausted from all the activity! 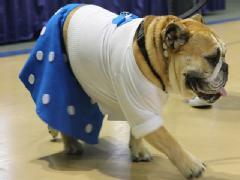 Over the weekend there was the Des Moines Iowa 32nd Annual Most Beautiful Bulldog contest . The contest is limited to only 50 canines and they are selected by lottery. This years winner was Lucy Brown. She sported a white sweater with pearls and a blue Poodle skirt. She was the winner hands down with Vincent da Mobster as runner up. I am sure if Ozzie had a chance at it he would come up a winner! 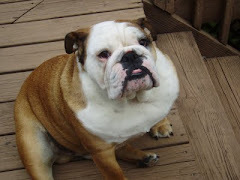 Though I suppose we all think that our bulldogs are the most beautiful dogs and each one is a winner! Ozzie is not very competitive and could care less about contests. He feels comfortable just being Ozzie. Which is part of just being very cool I suppose! I ran out yesterday to pick up some flea and tick application from the vet. Its that time of year again and with the extra wet weather the tick population is just loving it! Other than that it's life as usual and the Oz is working on his morning nap. Till next time...zzzzzzzzzzzzz! Ozzie reducing his carbon pawprint! Today along with being Good Friday is also Earth Day. I thought I would explore the ways we can be more "green" dog owners and there by more eco friendly to our environment. I discovered that a medium size dog has more of an impact on our environment than driving a luxury SUV 10,000 miles! A medium size pooch consumes 360 pounds of meat annually. While the average American consumes only 200 pounds. (Only, that seems like a lot of meat!) Dogs are large carnivores so they take a lot of land to provide their food. Honestly I just thought that Ozzie's output was more problematic to our environment at large than anything else! Here are some steps we can take to be more green when it comes to our canine pals. Spay or neuter. That should be a given for many reasons! Adopt from shelters or rescues versus buying your pet. Look to buy eco- friendly accessories made from natural materials. Buy dog food that uses organic ingredients or use brands that are made locally (shipping is taxing on the environment) You can also make your own dog food. I suppose we can all do something to reduce our ecological paw-prints! Stay green and a Happy Easter! Ozzie is getting on the toy band wagon this week. We were at Costco yesterday when we spotted this set of three tug toys that were labeled as "fun, fetch and tug" with a cartoon picture of a Bulldog in a Army helmet. ( Don't ask me how I know it was Army and not another branch of the service, just an assumption on my part!) The Army Bulldog was named "General Barker"! How could we pass that up! We brought it home and gave him one of the tug toys. He had a rousing 10 minutes of fun with his Dad until he tired of it. Then he decided to help me load the dishwasher by pre-rinsing the plates with his tongue. Oh Ozzie what would we do with out you! Today is April 18th Tax day. The government gave us a reprieve from the usual 15th due date since that is Emancipation Day, a holiday in DC. I have to go to the Post Office and more than likely stand on line with the rest of the folks holding out until today! Ozzie doesn't worry about taxes he leaves that to his humans. The only thing taxing in Oz' s life is getting from his food dish to the couch! There it is crawling up the bathroom curtains! Slowly lumbering in the lavatory! Eek! The Spring has ushered the return of the dreaded Stink Bug! I know better than to squash one of these bad boys of bug-dom. They give off a malodorous scent when stressed or smushed! Now Ozzie is an expert on stinky. He is currently 3 weeks away from his last bath and starting to give these bugs some competition. I manage to deal with them both though as I am ready to call the groomer to make Ozzie an appointment and capturing and relocating the latest SB visitor. Quite honestly I am not sure how the Stink Bug smells since I am too faint of heart to kill one or stress it out. I heard a reporter on TV describe the scent as an overpowering cilantro smell. Which doesn't seem bad compared to when Ozzie gets he stink on and smells more like cheese left out in the sun to rot! Have a great weekend all and watch where you step! Hm do I smell turkey with Swiss on rye with a dab of Grey Poupon?! I am ready for my close up Mr DeMille! Oh joy Spring is here and it's also hair! The shedding factor seems to have stepped up a bit but I will deal with it as long as the snow is gone and the weather has inched up over the freezing mark! Time to get some more flea and tick prote ction from the vet. The warmer weather will also create extra wrinkle patrol. I clean his face diligently at least 2 or 3 times a day. Every time I take out the box of baby wipes he heads in the opposite direction but eventually succumbs to the wipe! I also have been giving Ozzie a fish oil supplement hoping that will help maintain a healthier coat and skin. Honestly I give him fish oil from the Vitamin Shoppe which are not the supplements from the vets but I feel if they are good enough for me and they are basically the same thing! Yesterday Ozzie spent most of his time out on the deck lounging and supervised while I cleaned up the remnants of last falls mums that were still in the deck's flower boxes and planted a few pansies that will stand up to the cool nights. We are looking forward to firing up the grill soon and having a few burgers. Ozzie is all for that .....right Oz...Ozzie ....ZZZZZZZZZZZZ....oops time for another nap! "Unless this couch can fly I'm staying put!" 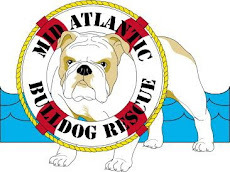 With the number of deaths recently of bulldogs and other brachycephalic breeds (Flat faced, this goes for Persian breed kitties too ) airlines are reconsidering or even banning these breeds from flying in the cargo hold. Their already challenged pulmonary systems are at risk when they are aboard in the cargo where it can be stuffy and hot. So if you cannot fit your pet in a carrier on the floor in front of your feet than they should be grounded! Since this is an impossibility for Ozzie ( unless we pay for a seat in First Class for him, that is the only way he will fly! ) he will have to take Amtrak! The MidAtlantic Bulldog Rescue is having it's Spring time Bulldog bash down at the Wonder Bar in Asbury Park April 30th. 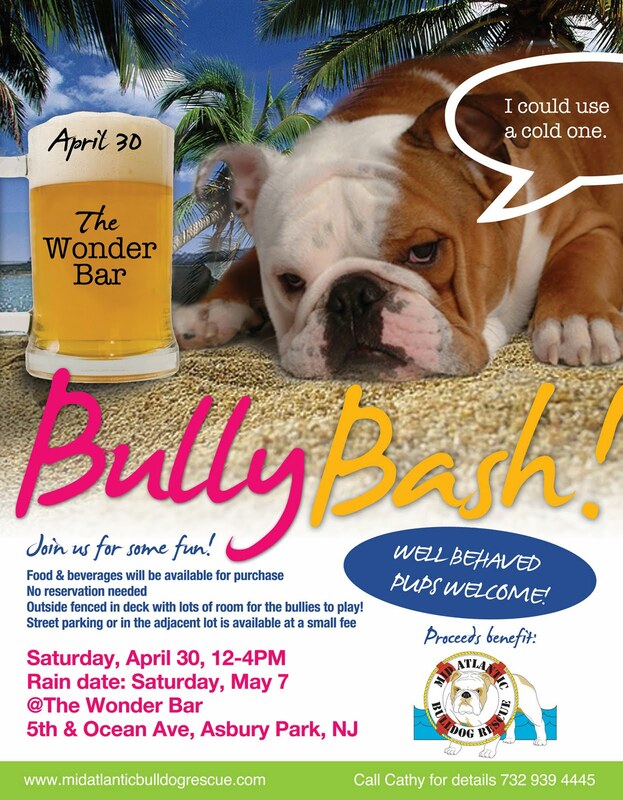 It looks like fun and a great way to raise some money for the rescue which now is taking in other breeds because of the huge need for help to a surplus of surrendered dogs! I have a sinking feeling that day is the same day as our ski clubs annual dinner dance! Both events are logistically as far apart as can be! I'll have to check on that. I hate to miss the MABR events but some how I don't think Ozzie cares! He most happy when he is at his home turf!